Alice Lee Giannetta said she did not know the first thing about the world of pageantry until her husband Pat told her about the Mrs. America competition. That curiosity lead Giannetta, a lawyer who has also worked as a model, to begin researching the pageant online. She quickly learned the history of the contest, which was founded in 1977 and celebrates married women who devote considerable time to community service. A litigation attorney who supports organizations that serve New York’s Asian and Asian-American community, Giannetta said she was instantly intrigued. But she was struck by the lack of diversity among the pageant contestants. The Manhattan-based Giannetta then entered and won the Mrs. New York competition last November. She will next compete for the Mrs. America crown, which is scheduled to be broadcast on Aug. 26. As she tried to piece out what Asian-American identity meant to her, Giannetta said she turned to pop culture, particularly "The Baby-Sitters Club" books featuring the Japanese-American character Claudia Kishi. Giannetta realized that competing in pageants was quite different from working as a model. And while she was used to making strong arguments and defending her positions on issues in the court room, she was not experienced in talking about herself. 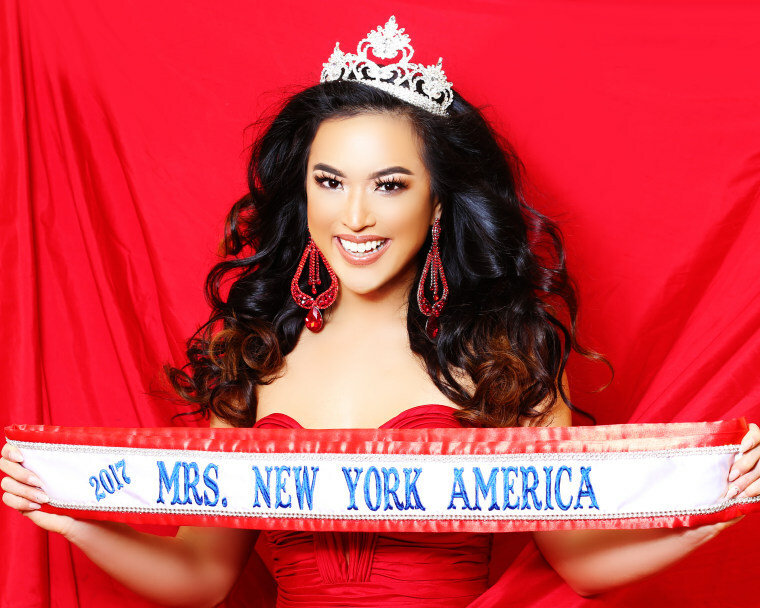 Pageant culture was also completely new to Giannetta: As she worked her way up to the Mrs. New York contest, she discovered that there were many traditions and unspoken rules she wasn’t familiar with. “A lot of the girls presented each other with contestant gifts, and I was very embarrassed because I didn’t have anything,” Giannetta said. One thing that Giannetta did find easy was talking about her philanthropic causes. After moving to the United States as a child from Taiwan in the early 1990s, Giannetta watched her parents struggle to build a new life for themselves. Giannetta said that those memories along with her experience learning English after enrolling in school inspired her to get involved with organizations serving families like hers in New York City. She said she became involved in the founding of Brooklyn Asian Voice Organization (BRAVO) — a nonprofit that serves teens of Asian descent — in 2008. Looking back, Giannetta admits that she was initially hesitant to tell her attorney colleagues about her foray into pageantry. But once they found out, they were thrilled, Giannetta said. They even helped her prepare for the question-and-answer portion of the contest.